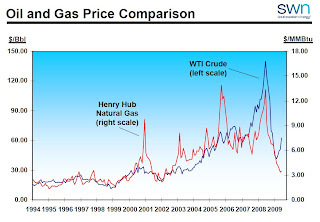 Back in April I posted some charts compiled by Southwestern Energy that showed the dynamics between oil prices and gas prices as well as between gas prices and gas rig counts. Now with a couple more months of data, the charts are even more interesting. First, in terms of the relationship between oil and natgas prices, the dynamic is way off. Usually, they move in the same direction. Historically, oil/barrel is about 8x the price of natgas/MMBtu. Yesterday in terms of spot prices, that ratio stood at 16.7x. The right tail of the image shows the divergence graphically. 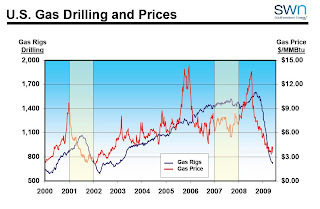 The second chart shows the relationship between natgas prices and natgas rig counts. The trend of decline continues, but the rigs have maintained a steeper fall than the gas price. With last week's increase in rigs nationally, I imagine the rig curve is going to follow the price curve, at least for a little while. Labels: Natural Gas Prices, Rig Counts, Southwestern Energy Co.